With the promise of 20+ billion connected devices in IoT - powering them is a problem. 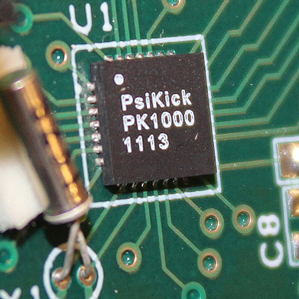 A Virgina based started called psikick is development a microchip for simple sensing tasks - that depending on the application, consumes a fraction of the power of comparable chips on the market. This new kind of low power chip could be revolutionary within the IoT space. A brainchild of two MIT graduates, David Wentzloff and Benton Calhoun - the startup plans to start selling the first chips by 2015. Wentzloff stated that the power consumption is between 0.1 and 1.0 percent - requiring so little power means the chips can function based on power that can be scavenged without the use of a battery. Normally, transistors in circuits are either on with current flowing through them; or off with no current flowing through them - depending on whether the voltage supply is above or below a certain threshold value. In reality, though, a small amount of current can leak through most transistors even when they are technically switched off. Energy could come from a small solar panel; an antenna that collects ambient radio wave energy; a thermoelectric material that absorbs body heat or even piezoelectric devices that collect energy from simple movement. It is this combination that if can be tailored into the design of solutions that could revolutionize the IoT sector.